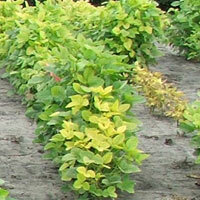 Iron deficiency chlorosis (IDC) of soybean is a physiological disorder caused by iron deficiency in the plant. 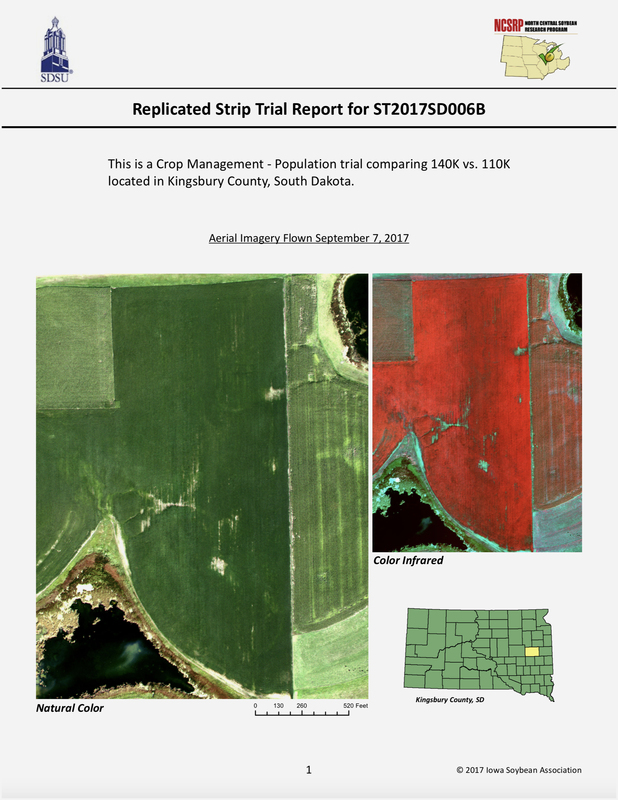 It is an important production issue in some fields, and pockets within fields, that can result in substantial yield loss. IDC is not caused by a lack of iron in the soil, but by an inability of the plant to take it up. Soybean is particularly susceptible to IDC. Soybean plants obtain iron from the soil by releasing acids into the soil to solubilize the iron into a form readily taken up by the roots. In high pH soils with high levels of bicarobonates, however, this process can be limited by the chemical reactions between the bicarbonates and the iron. Iron is necessary for the formation of chlorophyll, which is the green pigment in plants. 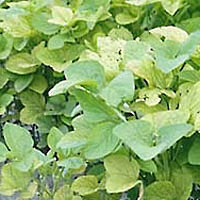 If not enough iron is taken up by the plant, yellowing between the leaf veins occurs, and growth and yield are affected. Because iron is immobile in the plant, the deficiency will manifest in the younger leaves first. 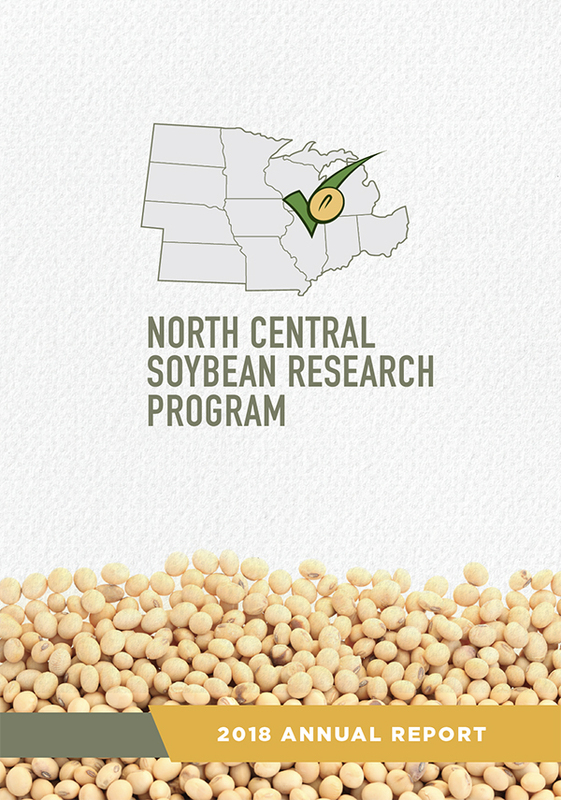 Soybean producers throughout the North Central region identify IDC as an important production issue, resulting in substantial yield losses in some years. 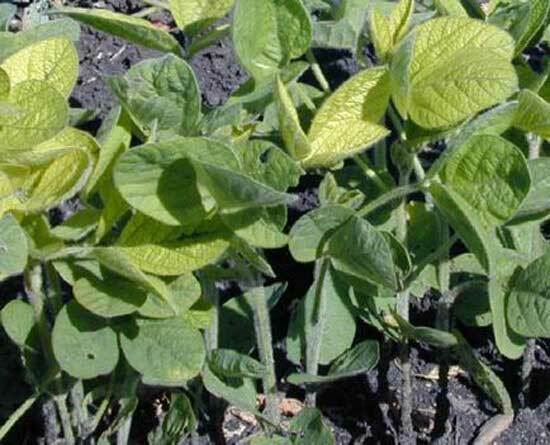 Research has confirmed that soybean in chlorotic areas of fields had lower leaf chlorophyll concentrations, stunted growth, and poor nodule development relative to nonchlorotic plants. 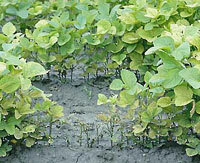 Chlorosis can result in reduced soybean growth and yield, as illustrated in the graph below. 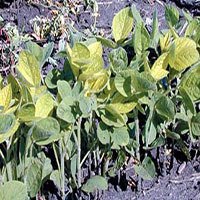 Relationship between the severity of chlorosis at the 5-6 trifoliolate stage and seed yield of soybean, North Dakota, 1998-2000. 5=very severe chlorosis, plants with stunted growth, and youngest leaves and growing point necrotic, or entire plants dead. Soybean with iron chlorosis usually first shows up in low and wet areas of soybean fields. These fields often have high pH (greater than 7) and poor drainage. Submit both a plant and a soil sample for diagnosis. To determine the primary cause of the leaf chlorosis, submit a plant sample to the diagnostic clinic in your area. Check in the Diagnostic Tools menu for how and where to submit a sample. Information on the soil conditions in which the affected plants are growing may help the diagnosis. Take a soil sample at the same place the plant sample was taken, and submit this to your soil testing lab to determine soil pH, percentage of free calcium carbonate, and soluble salts. Symptoms appear on the youngest upper leaves. The leaves are yellow, with the veins remaining green. The older trifoliolate leaves remain green.If deficiency persists or is severe, leaves turn white and plant growth is stunted. The intensity of chlorosis may increase or diminish during the growing season, depending on growing conditions and changes in soil chemistry. The symptoms are more pronounced when soil temperature is low and moisture is high. Root rot often occurs on plants suffering from iron chlorosis. This is thought to be due to the increased susceptibility of chlorotic plants to root pathogens. Cysts of soybean cyst nematodes, which are favored in high pH soils, are often found on plants showing iron chlorosis symptoms. 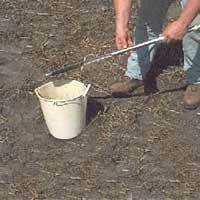 Take a soil sample at the same place the plant sample is collected. High natural bicarbonate levels which are generally indicated by high calcium carbonate equivalents and high soluble salts. The most successful management strategy for IDC is to select a soybean variety with tolerance to IDC. 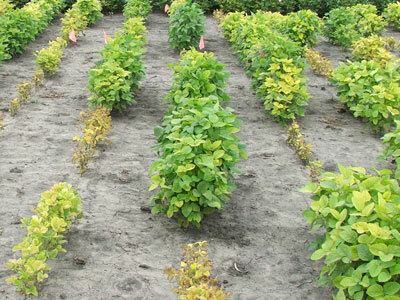 There have been major improvements in soybean varieties that are tolerant to the soil and environmental conditions that lead to iron chlorosis. Most public and private soybean varieties have been rated for IDC tolerance. Excess soil nitrates can worsen an IDC problem by furthering inhibiting the plants ability to take up iron. 3. Apply iron as EDDHA iron chelate on the seed at planting. Iron chelates placed on the seed at planting can be an effective way to get iron into the plant. The type of iron chelate is important: the EDDHAA, or "ortho-ortho" formulation keeps iron available to the plant for a long enough time to prevent IDC from developing. Other less expensive forms of iron chelates do not. To keep costs down, target areas with a history of moderate to high levels of IDC. It's important to apply the iron chelates close to the seed. Fortunately, there is little or no risk of seedling injury from these compounds, even though starter fertilizer is not generally recommended for soybean. Research on coating seeds with iron chelates is ongoing, but so far not enough iron remains on the seed to correct the problem. Adding iron fertilizer to soil will not correct an IDC problem. 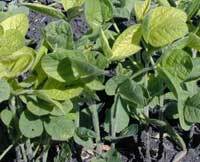 Applying an iron chelate to soybean leaves may work, although it is hard to predict when and how much to apply. Research on foliar application of iron is ongoing. Researchers in Minnesota report that planting oats as a competition crop just ahead of planting soybeans, and then killing the cover crop with glyphosate at a height of 10 to 12 inches has proved to be a consistently effective management practice. The oat crop absorbs excess nitrate-nitrogen and soil moisture enough to keep soil iron available to the soybean crop. Timing is important: killing the cover crop at 10 inches allows enough growth for the cover crop to have an effect on soil conditions, but not too much growth to compete with the soybean stand. Planting an oat cover crop may be managment intensive, but it can be very effective in preventing IDC in some fields. Photo: John Lamb, University of Minnesota.